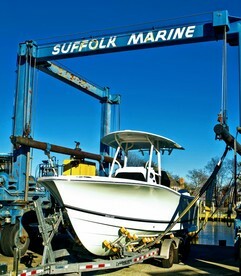 Sumpwams Creek in Babylon Village Long Island is where you’ll find Suffolk Marine Center. This location has been a working boatyard for over 100 years and the tradition continues today. Specializing in family sport fishing boats, Suffolk Marine offers many choices for the serious angler. Whether you’re looking to fish the offshore canyons or explore the back bays, Suffolk Marine can accommodate your specific needs.